Research background: Payout policy has attracted a great deal of research, how-ever it still has not been satisfactorily explained why corporations repurchase their shares. The most popular explanation for share repurchases is their signaling power. An alternative explanation for share repurchases is related to free cash flow. We assume that both theories are not competitive, due to the fact that the motives for share repurchases may differ depending on the firm’s life cycle stage. Purpose of the article: The aim of the paper is to test the hypotheses that companies in growth stage are more prone to repurchase their shares due to the their undervaluation. Methods: Our analysis focuses on 116 repurchase on WSE and 47 repurchase on NewCon-nect in Poland during the period 2004–2016 to test the hypothesis. We assume that companies listed on WSE are in their mature stage while listed on NewConnect are in the growth stage. We use market value to book the value ratio (M/BV) and the relation of M/BV ratio for the repurchasing company to the M/BV ratio for the whole market at the date of implementing share repurchase program as a proxies for firm valuation. Findings & Value added: Our study does not confirm that repurchased companies at a growth stage are more undervalued than repurchased companies at a mature stage (at statistically significant level), however there are more repurchased companies at a growth stage with lower M/BV value than repurchase companies in mature stage. Adding corporate life cycle theory into the study, our result can contribute to the literature by more distinctly understanding the motivation of share repurchases. The results might be helpful for companies to determine their financial policies and for investors to determine their investment decisions. Anthony, J. H., & Ramesh, K. (1992). Association between accounting performance measures and stock prices: a test of the life cycle hypothesis. Journal of Accounting and Economics, 15(2-3). doi: 10.1016/0165-4101(92)90018-W.
Asquith, P., & Mullins Jr., D. W. (1986). Signalling with dividends, stock repurchases, and equity issues. Financial Management, 15(3). Baker, M., & Wurgler, J. (2004). Appearing and disappearing dividends: the link to catering incentives. Journal of Financial Economics, 73(2). Bhattacharya, S. (1979). Imperfect information, dividend policy, and the bird in the hand fallacy. Bell Journal of Economics, 10(1). Black, E. L. (1998). Life-cycle impacts on the incremental value-relevance of earnings and cash flow measures. Journal of Financial Statement Analysis, 4. Blouin, J. L., Raedy, J. S., & Shackelford, D. A. (2011). Dividends, share repurchases, and tax clienteles: evidence from the 2003 reductions in shareholder taxes. Accounting Review, 86(3). Chan, K., Ikenberry, D. L., Lee, I., & Wang, Y. (2007). Share repurchases as a tool to mislead investors: evidence from earnings quality and stock performance. AFA Boston Meetings Paper. doi: 10.2139/ssrn686567. Retrieved from http://ssrn.com/abstract=686567. Dann, L. Y. (1981). An analysis of returns to bondholders and stockholders. Journal of Financial Economics, 9(2). Dittmar, A. L. (2000). Why do firms repurchase stocks. Journal of Business, 73(3). doi: 10.1086/209646. Dittmar, A. L., & Dittmar, R. (2002). Stock repurchase waves: an explanation of the trends in aggregate corporate payout policy. doi: 10.2139/ssrn.346548. Retrieved from http://ssrn.com/abstract=346548. Dittmar, A. L., & Dittmar, R. (2007). The timing of stock repurchases. doi: 10.2139/ ssrn911308. Retrieved from http://ssrn.com/abstract=911308. DeAngelo, H., DeAngelo, L., & Skinner, D. J. (2004). Are dividends disappearing? Dividend concentration and the consolidation of earnings. 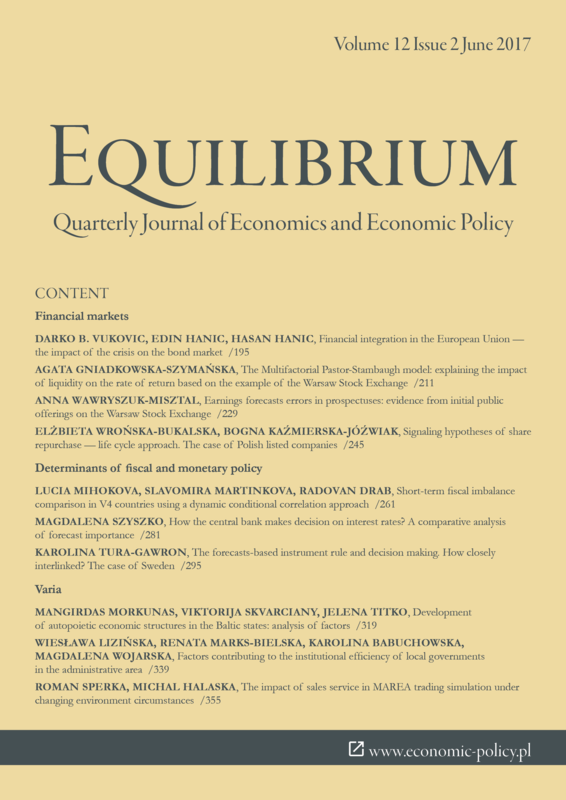 Journal of Financial Economics, 72(3). Easterbrook, F. H. (1984). Two agency-cost explanations of dividends. American Economic Review, 74(4). Evans, J. P., Evans, R. T., & Gentry, J. A. (2001). The decision to repurchase shares: a cash flow story. EFMA Lugano Meetings. doi: 10.2139/ssrn.263022. Retrieved from https://ssrn.com/abstract=263022. Fenn, G. W., & Liang, N. (2001). Good news and bad news about share repurchases. Journal of Financial Economics, 60. Firth, M., Leung, T. Y., & Rui, O. M. (2008). Double signals or single signal? An investigation of insider trading around share repurchases. Journal of International Financial Markets Institutions and Money, 20(4). doi: 10.1016/j.intfin.2010.05.002. Grossman, S. J., & Hart, O. D. (1980). Takeover bids, the free rider problem, and the theory of the corporation. Bell Journal of Economics, 11(1). Grullon, G., & Michaely, R. (2002). Dividends, share repurchase, and the substitution hypothesis. Journal of Finance, 57. Hyderabad, R. L. (2013). An examination of free cash flow hypothesis in Indian repurchase decisions. Asian Journal of Business Management, 5(1). Ikenberry, D., Lakonishok, J., & Vermaelen, T. (1995). Market underreaction to open market share repurchases. Journal of Financial Economics, 39(2-3). Jagannathan, M., & Stephens, C. (2003). Motives for multiple open-market repurchase programs. Financial Management, 32(2). Jensen, M. C., & Meckling, W. H. (1976). Theory of the firm: managerial behavior, agency costs and ownership structure. Journal of Financial Economics, 3(4). Jensen, M. C. (1986). Agency costs of free cash flow, corporate finance, and takeovers. American Economic Review, 76(2). John, K., & Williams, J. (1985). Dividends, dilution, and taxes: a signalling equilibrium. Journal of Finance, 40(4). Khaledi, N., & Darayseh, M. (2013). Information content of share repurchases. Economics, Management, and Financial Markets, 8(3). Lee, B. S., & Suh, J. (2011). Cash holding and share repurchase: international evidence. Journal of Corporate Finance, 17(5). doi: http://dx.doi.org/ 10.1016/j.jcorpfin.2011.06.006. Liang, W., Chan, K., Lai, W., & Wang, Y. (2013). Motivation for repurchases: a life cycle explanation. Journal of Financial Services Research, 43(2). doi: 10.1007/s10693-011-0126-7. Miller, D., & Friesen, P. H. (1984). A longitudinal study of the corporate life cycle. Management Science, 30(10). Miller, M. H., & Rock, K. (1985). Dividend policy under asymmetric information. Journal of Finance, 40(4). Nohel, T., & Tarhan, V. (1998). Share repurchases and firm performance: new evidence on the agency costs of free cash flow. Journal of Financial Economics, 49(2). doi: 10.1016/S0304-405X(98)00022-1. Ofer, A. R., & Thakor, A. (1987). A theory of stock price responses to alternative corporate cash disbursement methods: stock repurchases and dividends. Journal of Finance, 42(2). Padgett, C., & Wang, Z. (2007). Short-term returns of UK share buyback activity. Retrieved from http://www.icmacentre.ac.uk/files/pdf/dps/dp_200710.pdf. Ross, S. (1977). The determination of capital structure: the incentive-signaling approach. Bell Journal of Economics, 8(1). Shu, P.-G., Yeh, Y.-H., Chiang, T.-L., & Hung, J.-Y. (2013). Managerial overconfidence and share repurchases. International Review of Finance, 13(1). doi: 10.1111/j.1468-2443.2012.01162.x. Stephens, C., & Weisbach, M. (1998). Actual share reacquisitions in open market repurchase programs. Journal of Finance, 53. Vermaelen, T. (1981). Common stock repurchases and market signaling: an empirical study. Journal of Financial Economics, 9(2). Yook, K. C., & Gangopadhyay, P. (2010). Free cash flow and the wealth effects of stock repurchase announcements. Quarterly Journal of Finance and Accounting, 49(3/4). Yu, Y.-M., & Jiang, S. (2010). Corporate life cycle and share repurchases: evidence from the Taiwan stock Market. African Journal of Business Management, 4(14).